Panama High School "Speed Boys"
Panama (population 323) is located in southwestern Illinois about 40 miles northeast of East St. Louis. Panama is located on the Bond County - Montgomery County borderline. The main drag through town is Panama/Donnellson Avenue which connects to Illinois Route 127 about two miles to the east. The Norfolk & Western Railroad runs by the southeast edge of town. Bearcat Creek flows to the east of the village. The town of Panama was officially incorporated in 1906. It is likely a high schoiol was established in the early 1900s. The high school in Panama was well supported and successful for about five decades. It was in the early 1950s that several surrounding communities agreed to consolidate their efforts into one district. This occurred in 1954 when the school districts of Panama, Irving, Coffeen, Butler, Donnellson, Taylor Springs, and Schram City all joined Hillsboro to create the Hillsboro Community School District. It is not known what has become of the Panama School building. It is not even for sure if the building is still in use or still standing. If you have this information please forward it to us via e-mail at eganann@sbcglobal.net. For more excellent information on the town of Panama and its history check out www.daleeccles.net . Webmaster Dale Eccles has put together some incredible history and photos that combine to make a great tribute to this town's glorious mining past. Panama High School must have had some great rivalries with the schools listed above. Donnellson and Sorento are both within 3 miles of Panama and probably provided for some GREAT rivalries each year. It is known that Panama offered basketball and baseball. It is believed that track & field was also offered. If you have any further information on the Panama High School athletic program please drop us a line. 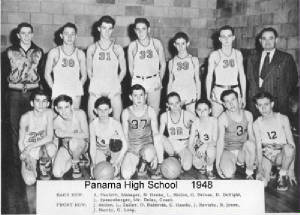 The Panama High School boys basketball team had some excellent years of competing in their area. The boys won a total of three District Titles. The only mention of the Panama on the IHSA web site (www.ihsa.org) is in boys basketball. Unfortunately only the years when the titles were won are listed. We are searching for the records and coach's names of these and other great Panama High School teams. ***Through research conducted by Mark Jurenga we learned that Panama High School squared off with the mighty Collinsville Kahoks one time. *Collinsville is #2 in IHSA history in wins with 1,939 after the 2006-2007 season.